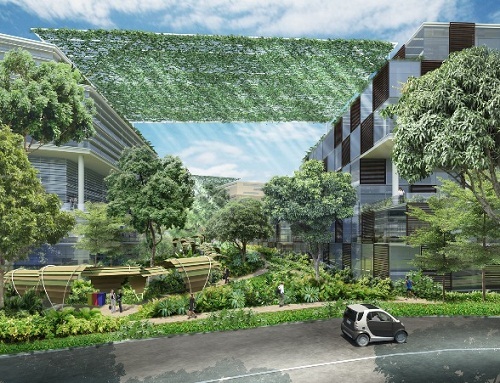 JTC Corporation (JTC) recently unveiled the masterplan for the CleanTech Park (CTP), Singapore’s first eco-business park for companies involved in clean technologies and sustainable urban solutions. The CTP also serves as a R&D and testbedding site for early adoption of clean tech products and solutions for the urban tropics. Besides clean tech companies, the CTP could also house companies providing eco-friendly products and services, and companies with strong CSR or green practices. 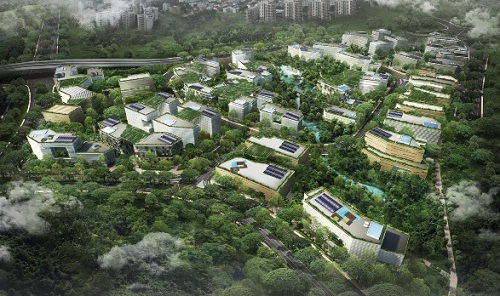 The 50-hectare CTP will be developed next to the Nanyang Technological University so as to enhance the integration between the academia, research institutes and the business industry, and provide synergies for the full value chain of the clean tech industry. The development will take place in 3 phases over 20 years. Phase 1 will commence in July 2010 and will provide about 17 ha of business park land when completed in 2018. Phase 2 will be developed from 2019 to 2025, and Phase 3 from 2026 to 2030. The CTP will house a working population of 20,000 when it is fully built by 2030. Stormwater management: Making use of the existing topography of the site to channel stormwater into the low-lying areas for storage and reuse. The stormwater within CleanTech Park will be channelled into a central wetland where the water can be treated and be reused for irrigation or toilet flushing. The pond will also reduce the ambient temperature through evaporative cooling. Sky Trellis: The sky trellis will be constructed between adjacent buildings and covered with plants. By shading open spaces between buildings, it can reduce heat gain by the buildings from the environment and enhance walkability within open spaces in the area. Conservation of Green Zones: Conservation zones are demarcated areas within CTP where trees and plants are conserved. Development works are planned around these conservation zones to protect the existing trees and plants. Protection of biodiversity: Keeping the existing trees in the park will help to retain the biodiversity, such as the birds and butterflies to remain within CTP. Designated Green Corridors: The designated Green Corridors are green areas between the buildings and land parcels within CTP. These green corridors are strategically located to provide secondary greenery between the buildings and land parcels and are aimed at promoting enhanced walkability within the Park. Building a Green Community: CTP will nurture the fist green business community and environment by way of introducing and inculcating green practices such as recycling programmes and car pooling programmes. Green Features that reduce demand on resource utilization: Building orientation with minimum East-West facing facades; Creating the wind tunnel effect to maximize wind-capture within the buildings; Using recycled and green materials for infrastructure development.